Time to sell your home in Sedgefield? Read about today's resort market area buyers. Sedgefield is a subdivision near downtown Fairhope, AL. 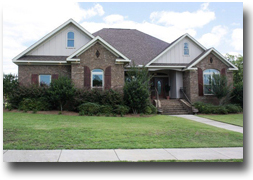 The homes are just West of Quail Creek golf club and approximately 3.5 miles East of Mobile Bay and a close drive to I-10 and about 40 minutes from both local regional airports in Pensacola, FL and Mobile, AL. Sedgefield homes typical range from 2,500 to 3,500 square feet. Fairhope, AL had been consistently voted one of the best places to live in the United States. Fairhope is home to a variety of restaurants, boutiques and other entertainment venues and a short drive to the Gulf of Mexico and the beautiful beaches of Gulf Shores and Orange Beach, AL. If you need further info, have questions or would like to schedule a viewing for any of the homes for sale in Sedgefield or any other properties in the area, please email info@condoinvestment.com or call 251.Area-Pro (251-273-2776) for immediate assistance. Also, browse all Fairhope Alabama homes for sale from CondoInvestment.com. Sedgefield in Fairhope, AL is approximately 35-45 minutes from the beautiful Alabama Gulf Coast. Perhaps best known for the condos that line the sugar-white sandy beaches, Gulf Shores has grown and changed a lot over the past decade. Gulf Shores is definitely a "drive-to" destination and new area attractions have been popping up, seemingly over night, for years to create a current environment laden with great things to do. We've gathered and published investment information for every condo on the coast from Mobile, AL to Panama City, FL. Users can enjoy our exclusive aerial imagery that offers unprecedented access to Gulf Shores and Orange Beach with views from high above that offer great perspectives and illustrate the proximity of one condominium to another or distance to area attractions. Our Gulf Shores condos for sale page offers many pre-defined searches making browsing real estate quick and easy and for those investment-minded buyers, revenue info for all condos is included, recently sold condos with the actual sold prices and closed dates and the option to sort by most recently sold or filter using price or building. Orange Beach is just a few minutes further East and the Wharf and amphitheater is one of the biggest draws in town and the talent visiting Orange Beach has continued to grow and become a great venue to see all sorts of entertainment. CondoInvestment.com offers the same great info on our Orange Beach condos for sale page as we do for Gulf Shores, as well as, Perdido Key and all other coastal areas from Mobile, AL to Panama City Beach, Florida. The Alabama Gulf Coast is also seeing a rise in new condo development or pre-construction condos that keeps the beaches growing with new condo developments.